You are here: HomenextResourcesnextAdvertisers cornernextpuckamuck - No need to hold your nose! How does your garden grow? For gardeners, allotment holders and farmers with a green conscience, it’s a good idea to use a bit of horse sense – and that’s just what an enterprising local duo is hoping to achieve, right across our region. 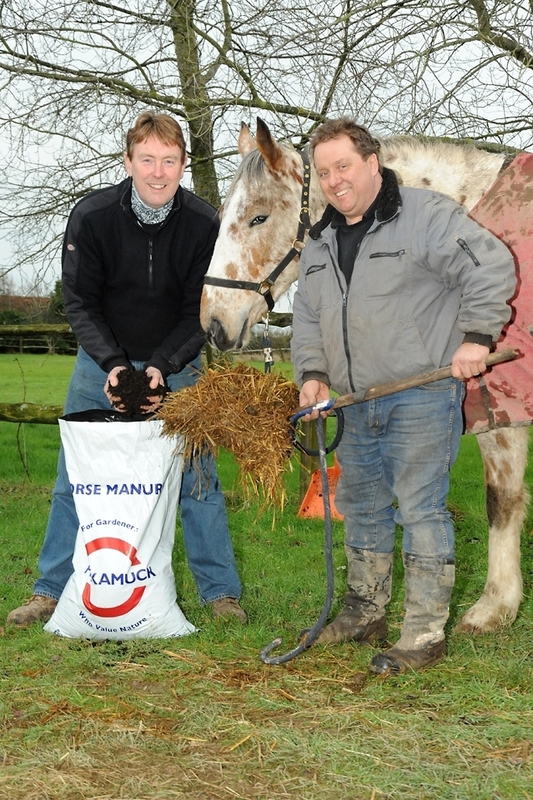 Richard Kennard and George Derrick, based in Findon near Worthing, at their aptly named Puckamuck depot, a subsidiary of Sussex Manures, are spreading the word, as well as the manure – and local growers just love it. What’s more, they’re donating part of their proceeds to a top racehorse rehabilitation charity, which means their enterprise is coming full circle. The Thoroughbred Rehabilitation Centre (TRC) is a charity dedicated to racehorse welfare, providing a secure future for ex-racehorses, through re-training and re-homing. Horse manure makes a fantastic natural fertiliser, but George and his team certainly wouldn’t recommend using it in your garden in its raw state. Puckamuck collects the manure from racing stables all over Surrey and Sussex, then shreds it, turns it and aerates it for anything up to a year before it becomes a sustainable full strength manure. And here’s the delicate question. What about the pong? But it’s not just about manure. Richard and George produce hay and haylage, too – a superior horse feed that’s grown from rye grass and baled in two sizes. This looks like a winner – by a nose! Sussex Manures is offering Brighton and Hove allotment holders deals on Transit tipper loads of ready to use, aged shredded horse manure. Puckamuck is naturally baked during the maturing process, the temperature inside the pile is sufficient to eradicate irritating weed seeds but not too high to discourage worm activity or damage the product. We are based in Findon West Sussex and our product is highly rated by domestic gardeners and professional growers alike. It is a natural and sustainable, organically sourced, fertilizer with which you can only improve the quality of your soil and crops. Mulch, top dress or mix in the soil for award winning vegetables, fruit and roses. Use it all year round, refreshing your soil as soon as you harvest. Wonderful stuff. We’ve used cow manure for the last couple of years which is hard to break up and spread whereas the manure we recently bought from Puckamuck is (almost) a pleasure to spread! I can also vouch for the fact that it doesn’t smell.